It’s easy to assemble and super powerful. But how will it do in actual testing? We took a look at the Antennas Direct DB8e and found it to be the perfect antenna for those stuck in between markets. Its unique pivoting elements give it the ability to see two directions at once, and its powerful 4-bay design means wherever it points, it gets the best possible signal. It was a beautiful day in our West Coast testing facility — 82 degrees with no wind. This is the perfect time to mount an antenna. We took the assembled antenna, our Solid Signal brand tripod and 50 feet of Solid Signal RG6 cable along with a 9 foot mast we had lying around the shop and headed up to the roof. The goal was simply to do the impossible. Our test facility is halfway between Los Angeles and Palm Springs, and the Palm Springs towers are hidden behind two 11,000 foot peaks. Could the DB8e penetrate through solid rock? We gave it a try. We aimed half of the DB8 west, and half east. Initial results were impressive. The DB8e picked up every station from Los Angeles, every single one including VHF-High. This antenna is not designed to pick up VHF-High, so that was definitely not a typical results. 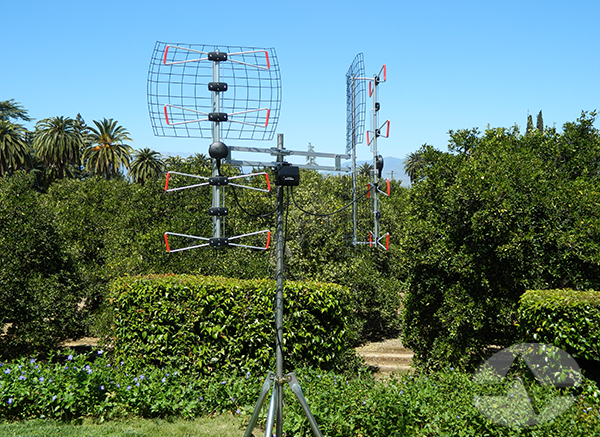 It also picked up four UHF stations that were in the Palm Springs market, 25 miles away at a heading of 85 degrees. That’s a first for our test site. Still, KESQ-DT and KMIR-DT, those bastions of Coachella Valley broadcasting, eluded us. With a mile or so of rock in between us and them, it’s not surprising. The DB8e wasn’t done doing tricks, though. Our only local station here at the test site is 8 miles away, almost due south, and through a hillside. Would the DB8e get the job done? The DB8e pulled off the trick of using one antenna to get local and distant stations, and it pulled in a channel broadcasting on the other side of a hill! 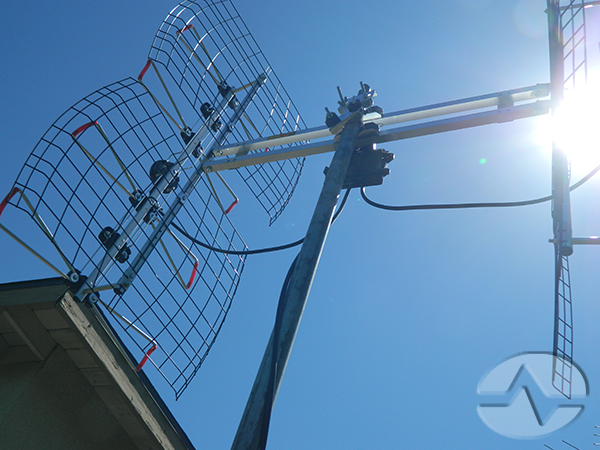 We’ve been consistently impressed with this antenna. You may not need its split-personality tricks but if you do, you’ll be glad to have it. We enthusiastically recommend this antenna for people between markets.